With a showdown against No. 1 Gonzaga looming next weekend, the 14th-ranked UNC men’s basketball team showed Wednesday night at the Dean Dome that it hasn’t lost focus of the task at hand—picking up a 97-69 victory over the visiting UNC-Wilmington Seahawks. 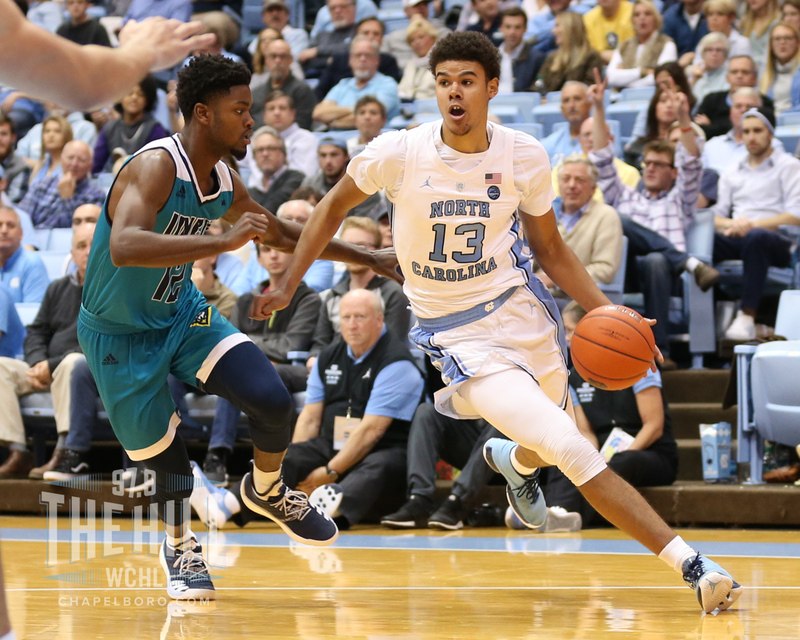 Despite playing without freshman point guard Coby White—the team’s leading scorer who missed the game with a minor ankle injury—the Tar Heels used a game-high 21 points from graduate transfer Cameron Johnson to get back into the win column. UNC (7-2) had lost two of its previous three games, all of which came against teams who have spent time ranked in the top 25 this season. UNCW (4-6) took the lead briefly with just over eight minutes left in the first half, but the Tar Heels responded with a 10-0 run that put things out of reach the rest of the way. Once the second half got underway, UNC quickly turned a nine-point halftime lead into a 23-point advantage—as it held the Seahawks to just two points during a span that lasted nearly 10 minutes. In addition to Johnson’s scoring, seniors Luke Maye and Kenny Williams each had 11 points. Freshman sensation Nassir Little added 14 points as the fourth, and final, Tar Heel to reach double figures. Head coach Roy Williams and company also played well on the defensive end, turning 25 UNCW turnovers into 34 points on the other side. When asked what he told his team in the halftime locker room to get them ready for the second half, Williams didn’t need many words. “I told them we sucked,” he told reporters. 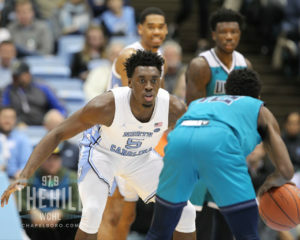 With the way UNC looked in that blowout loss on the road against Michigan, Wednesday’s outing was a good sign in that the Tar Heels refused to play down to their competition. It wasn’t a perfect outing by any means, but a win is a win. UNC now has to take time to get healthy and get ready for what will no doubt be its toughest test of the season next Saturday. One thing it won’t be doing much of, though, is practicing thanks to the grind of exam season. “We can’t practice,” Williams said. “I mean, seriously. We’re off tomorrow. We’ll do a run-and-shoot Friday. We’re off Saturday. And Sunday I told them we’re gonna have the best practice in the history of the civilized world. The rematch of the 2017 NCAA Championship Game will take place on Saturday, Dec. 15. That game will tip-off at 7 p.m.
Former UNC assistant coach C.B. McGrath made his first appearance at the Dean Dome as an opposing head coach, as he is now in his second year leading UNCW. Starting in place of White at point guard, junior Seventh Woods finished with seven points, three assists and three turnovers. In 18 minutes off the bench, sophomore forward Sterling Manley tallied eight points and 10 rebounds for UNC.